Amazon Watch’s Regranting Program responds to the urgent needs of our local partners on the ground in the Amazon Basin. Our goal is to strengthen the capacity and opportunities of indigenous organizations and local non-governmental organizations in the Amazon to defend their collective rights. How do you do your funding? Please describe Amazon Watch’s approach and process, explaining how it is different from conventional philanthropy. Our regranting efforts are key to our campaigns. This program allows us to support both our mission and our allies on the ground in the Amazon Basin. This is different from similar programs where micro grants are aiming to protect the rainforest –-it’s not an acre-saving program. We are not putting forests into conservation. We are directly supporting our partners on the ground who naturally protect the forest as part of their way of life. By strengthening their efforts for self-determination, supporting their fights for their rights and enabling them to do so, we are helping them and we are also protecting the Amazon. How did you come to practice philanthropy in this way? What made you realize this funding style would be important for what you were trying to achieve? Amazon Watch is an ally of our indigenous organizations in the Amazon that we partner with – we don’t intend to be seen as a funder but more as a valued ally. Our regranting program developed in response to the needs of our partners for short term funding needs to respond to urgent threats and opportunities on the ground in the Amazon. Some organizations buy land to conserve rainforests. Amazon Watch is an organization is dedicated to supporting indigenous peoples rights as well as protecting rainforests. Indigenous peoples are the true stewards of the vast majority of the World’s biodiversity. We find that our programs and campaigns lead to more tangible and real results when local indigenous communities in the Amazon have the capacity and resources to defend their own rights and rainforest territories. We have learned from other programs such as Rainforest Action Network’s Protect an Acre (PAA) program that uses a similar approach of supporting local forest peoples. Have you ever been met with resistance or criticism? Our main challenge has been our ability to attract sufficient funding to be able to respond quickly and sufficiently to the requests. Some funders say that small grants are not enough to make a real difference. Our experience is that small timely grants can make a huge difference on the ground. Another challenge is that the local organizations often need more substantial grants and the criticism is that our small grants are not sufficient. For example, in Ecuador one of our partners – who’ve said they don’t want to receive a little here or there for their planned assembly or travel. They need to have longer-term sustained support so they can run their operations more effectively. Any time our partners ask us for support, they’re grateful for what we can do – but often the needs being met are the tip of the iceberg. Our partners also seek long term economic alternatives and solutions that address their communities’ challenges and keep their members united in the face of lucrative offers of money and projects from oil and mining companies. Providing them with long term funding for the implementation of their life plans will go a long way in keeping communities in a strong position to defend their rainforest territories and rights in the face of large scale extractive industries. Not Creating Dependency: We received a large grant that supported us and our partners. Significant funds were made available to them – not just a mobilization here or there. This greatly increased their capacity to do their work. This funding was a one time grant that when it was depleted, we found that it had created a dependency that we did not foresee. It raises questions about how we ramp up and ramp down our grants to local organizations. We learned that we needed to build the local organization’s capacity to raise funds from diverse s­­­ources. Establishing Effective Systems for Tracking and Reporting Re-grants: Originally we had very basic system of grant agreements and financial reporting in place for tracking our re-grants and getting reports back. . In the last five years, we established more formal and improved processes to track funds in, and funds out, and reports back from grantees and results aggregated. We realized that we have administrative costs for making grants however, the culture of the organization has been such that these costs are absorbed by general support funds and most of the time not passed on to the re-granting program. What can you achieve through Micro Granting that might not be possible using conventional philanthropic funding models? We are able to empower our partners to do what they prioritize and see as most important for their own purposes in very short time horizons. Their success is our success after all. By being available to identify funds and solicit on their behalf we provide a service that their level of access to funding world can’t achieve. And when they are able to be strong and achieve their goals, our partnership is strengthened and the likelihood of success of our own campaigns increases. It’s good for all of us. Avoid dependency. Build capacity. Insist on accountability. Have a framework that you can apply as your filter or you’ll be overwhelmed. The funds we have are dedicated to supporting our core local partners in the regions where we are working and where who we have had long-term relationships. . Sometimes we’ll get requests from partners from regions where we don’t work closely and we do consider these on a case-by-case basis. Why does Indie Philanthropy matter to you? How has it changed your organization? Amazon Watch has re-granted over $2 million in small grants since 2006. That’s significant. We are proud of this achievement. The entire team of Amazon Watch is committed to supporting our partners on the front lines in every way we can –and the re-granting program is an important way that we do this. 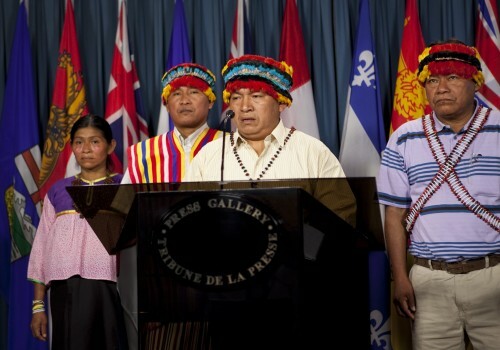 Providing funding for such activities as: an indigenous delegate to attend a shareholder meeting or to participate in an international tribunal; travel funds for indigenous leaders to visit and unite their base communities; mapping territorial boundaries and filing legal claims are all important examples of what our re-granting program supports. At times our re-granting is used to support the community’s Life Plan which may involve a riverbank reforestation project, improving the trails between communities, or supporting indigenous elders pass down their stories and songs to younger generations. Those are not typical grants but are ways that we have supported our partners. And all of these strategies are related to protecting the Amazon and supporting indigenous peoples’ own vision for stewardship of their rainforest homelands.